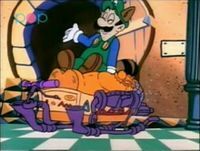 The Steam-Powered Mummy Sled is a special sled that Luigi constructed out of a destroyed steam machine that was once a part of his Steam Cloud Balloon. It appeared in The Adventures of Super Mario Bros. 3 episode "Mind Your Mummy Mommy, Mario". Needing a way to escape from a tower in Castle Koopa with Prince Mushroomkhamen's stolen mummy case with Princess Toadstool and Toad, Luigi thinks to himself "What would Mario do if he were here?". This gives Luigi the idea to build a sled out of the destroyed steam machine that can transport the mummy case. Being an expert plumber, Luigi manages to construct the Steam-Powered Mummy Sled in mere seconds. At the same time, Bowser orders Princess Toadstool to come down from the tower at the bottom of the stairs. However, he and his Paragoomba guards are shocked to see the mummy sled charging down the stairs. Some of the Paragoombas try attacking Luigi, Princess Toadstool and Toad, but Raccoon Luigi manages to take care of some of them with his tail, while the sled plows through several more. After speeding past several Chain Chomps, the sled goes flying out of the castle, and lands in the moat around Castle Koopa. Despite being built out of pipes and having to support the weight of four riders plus a golden mummy case, the mummy sled can float, and is able to function as a motorboat. The Steam-Powered Mummy Sled is never seen again, as Luigi, Princess Toadstool and Toad apparently ditch it for reasons unknown by the time they return Prince Mushroomkhamen's case to Queen Mushroomkhamen. This page was last edited on August 17, 2018, at 22:51.